we were supposed to shotgun strongbow together (which will have to happen before the year is through) for her birthday but things didn't work out that way. 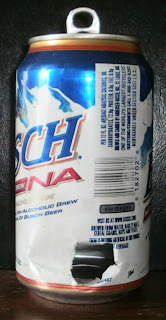 luckily, on the drive out to the camping spot we stopped at a store that sold singles of busch non-alcoholic. hooray! now i don't have to buy a 6 pack of it!